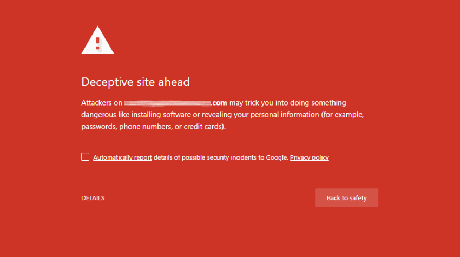 An interstitial warning page is shown when Google wants to warn or notify a user about a particular risk or concern before a web page is loaded into the browser. For example, if a web page has been flagged as a phishing site, it will display the above warning before allowing you to proceed. At these warning pages, users can decide whether they want to ignore the warning and proceed or go back to the previous page they were at. While researching the recent deceptive mobile billing interstitial coming to Chrome 71, I stumbled onto the internal chrome://interstitials page that allows you to view all warnings that are supported by the particular Chrome version you are using. For example, Chrome 70 will have different warning interstitials than Chrome 71. When at this page, you can view interstitials related to SSL, SafeBrowsing, Captive Portal, and Supervised Users. For the Safe Browsing category, you can also see normal warning pages that are shown in Chrome for mobile and desktop as well as the quieter warnings that will be displayed by Android apps using WebView. WebView is the Android platform that allows web pages to be viewed within Android apps. The warnings for WebView are typically "quieter" than the warnings shown in Chrome browser itself. For example, below is the traditional Safe Browsing interstitial a user would see when going to a site that is distributing malware. The WebView warning, though, uses a much quieter template. Below is the full list of available interstitial warnings as of Chrome 72, which is the current Chrome Canary build. • Captive Portal, WiFi with network name "CoffeeShopWiFi"